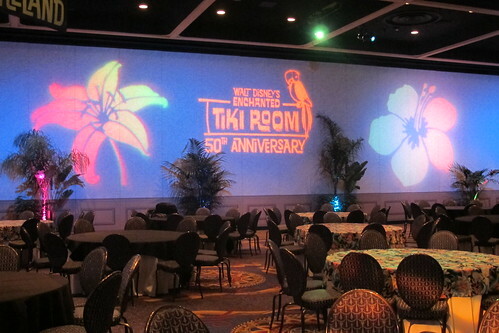 Last month marked the 50th anniversary of Walt Disney’s Enchanted Tiki Room at Disneyland, so you know what that means — merchandising opportunity! 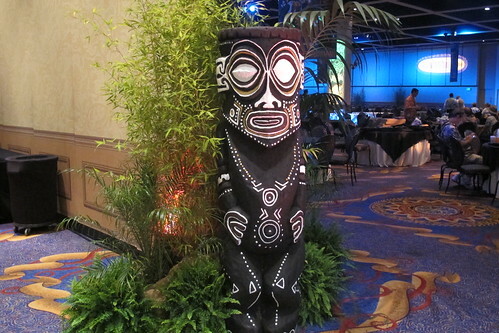 Disney held a product release event June 28-29 at the Disneyland Hotel (and an even pricier $185 cocktail reception with Shag on Saturday night). It wouldn’t be Disney if there wasn’t a line involved, right? 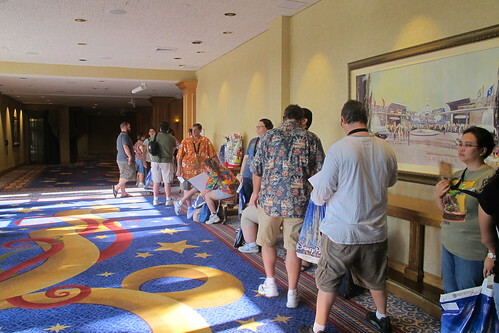 First, you had to go to registration to sign in and confirm that you received all the paperwork (assigned time for the artists signing, etc.). After that, you headed to another station to pick up the merchandise you’d already purchased through the RSP (Random Selection Process). 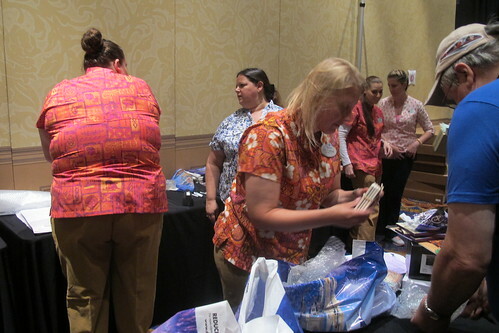 Cast members then unwrapped each item to doublecheck they were correct and intact. Friday night was so understaffed that this whole process took up to three hours for some people. (Strange since this event had been sold out for weeks so it’s not like they didn’t know how many people would be showing up.) There hadn’t been anything special scheduled for Friday night so I’d decided just to go Saturday, and the wait time was significantly shorter. So what would compel all these people to pay $89 apiece to basically just shop? For starters, this was another Disney collaboration with Shag, plus several other amazing artists, like Kevin Kidney and Jody Daily. 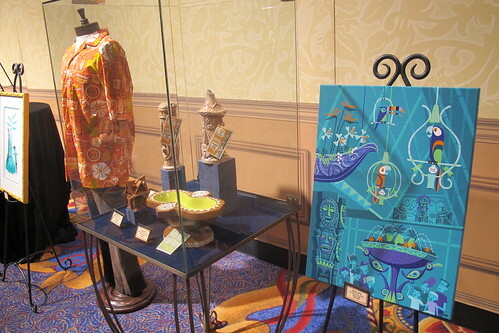 They designed a whole slew of stuff, including pins (oh so many pins), tiki mugs (and a bowl inspired by Disney’s Polynesian Resort that snuck in under the radar), postcards, coasters, prints, a purse, shirts, tiki figurines, original art and more. Working with The Mouse I believe for the first time was Doug Horne, another one of my favorite artists on the tiki scene. 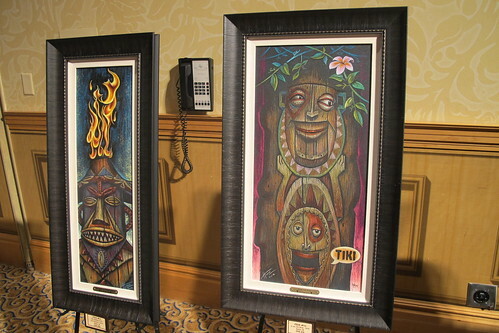 He created these two pieces: “Pele, Goddess of Fire and Volcanoes” and “In the Tiki Room,” which are also being sold as prints ($40). 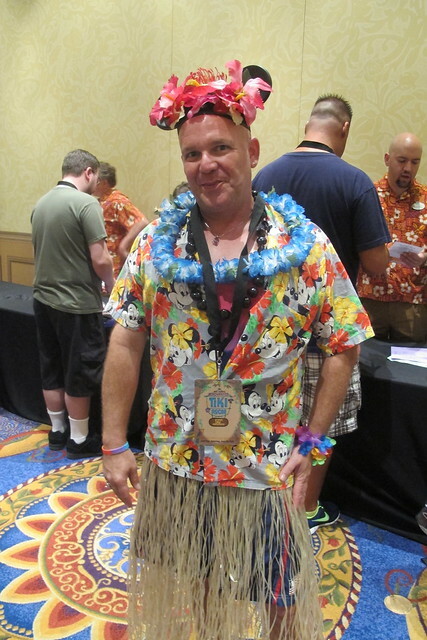 Everyone was encouraged to wear Hawaiian/Polynesian attire, and it was fun to see folks who really went all out for the occasion. 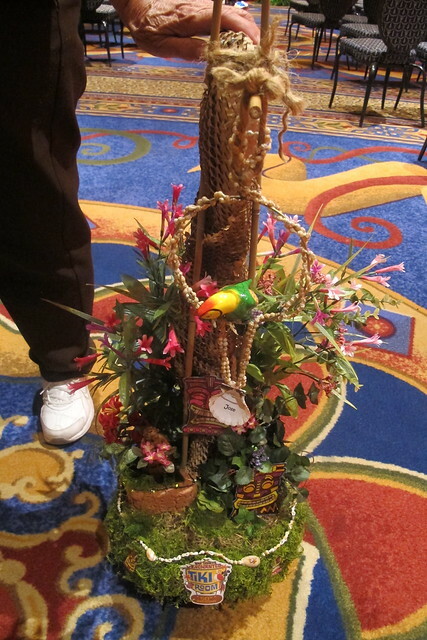 One woman had turned her walker into a functional work of art by covering it with moss, cardboard packing material, flowers, shells, parrots and tikis. 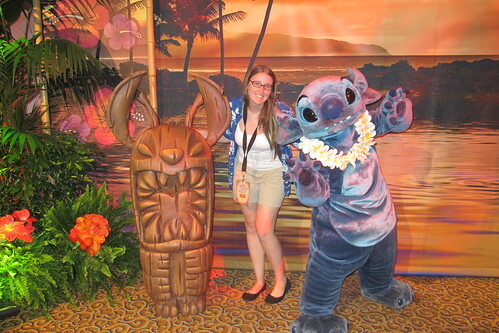 The ballroom was mostly a space for people to relax or engage in pin trading — a running theme of the event —- but there was also a photo-op area where you could pose with Stitch (and a Stitch-inspired tiki) in front of a beachy background. How could I resist? 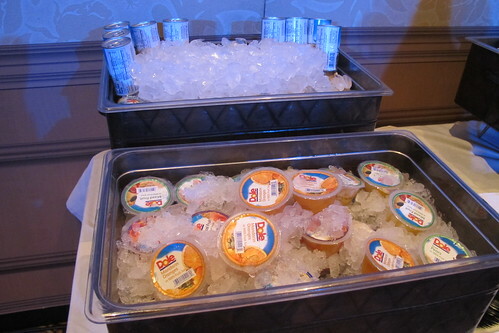 Dole has been a sponsor of the Enchanted Tiki Room since 1976, and they supplied goodies for the event, like cans of pineapple juice, fruit cups and recipe cards (the same ones I’ve picked up before at the Dole Whip stand). 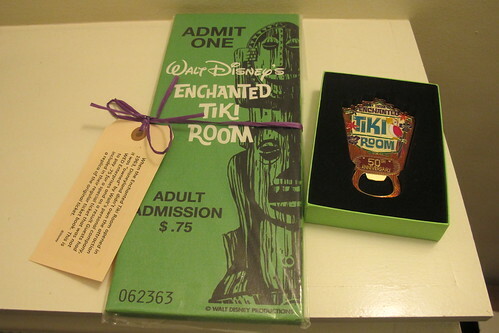 All attendees received two free commemorative gifts: an Enchanted Tiki Room bottle opener (doubles as a magnet) and a wooden sign made to look like the 75 cent tickets that Disneyland guests had to purchase to visit the attraction when it opened in 1963 (because technically the Enchanted Tiki Room was not owned by Disneyland but by Walt’s personal company, WED Enterprises). And if you had registered for the event right away you also got an “Early Birdies” pin. I was pleasantly surprised by the quality of all the swag. 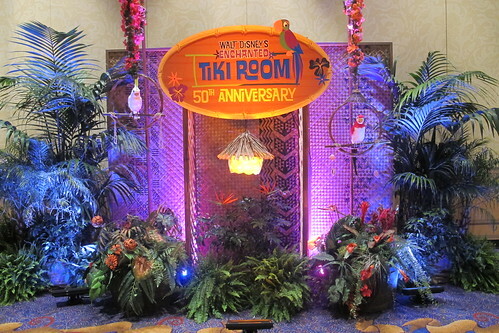 However, the part that truly made this event worthwhile was the “Memory Room” Q&A panels with original imagineers from the Enchanted Tiki Room and their contemporaries who recently worked on restoring the attraction. 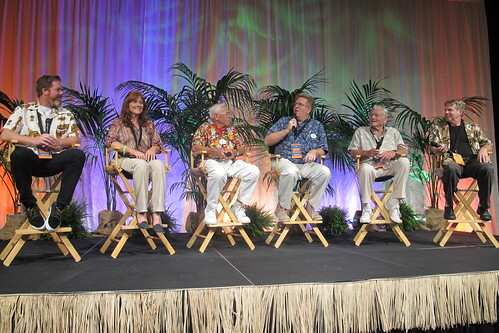 Bob Gurr talked about drawing the birdcages that hide some of the mechanics, while Rolly Crump relayed “cute stories” about designing the tikis in the garden and what it was like working with “The Old Man” (Walt Disney). My husband and I made the trip from IL for this. We waited the 3 hrs on Friday (and later heard people were turned away at 9, even if they had waited for hours). The swag and merch were awesome, but this should have been managed much better than it was. The Q & A was truly the highlight! I really was surprised at the issues they had Friday night (and even Saturday, when none of the cast members seemed to be able to answer any questions about the day’s schedule). Hopefully they’ll learn from this! My husband and I waited almost 4 hours to pre-register on Friday. So poorly managed and I think it could have been so much more fun. I was very disappointed with the event. My mom waited in that line on Friday and I was shocked to hear how bad it was.